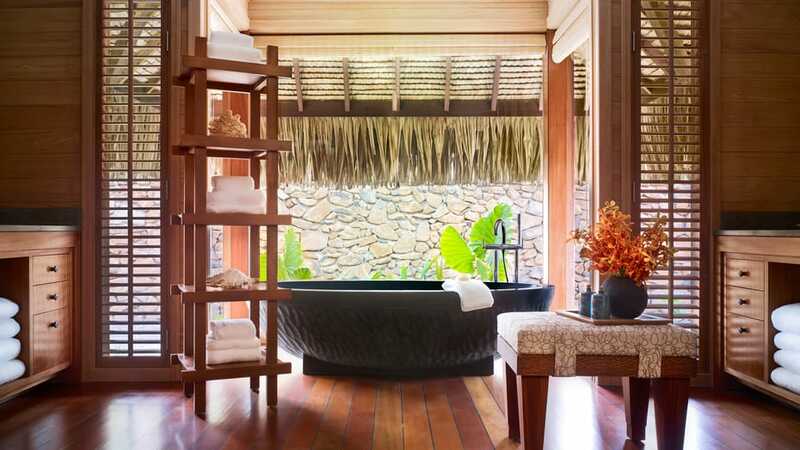 You can truly relax while enjoying a bubble bath and a sweeping view at one of these hotels. 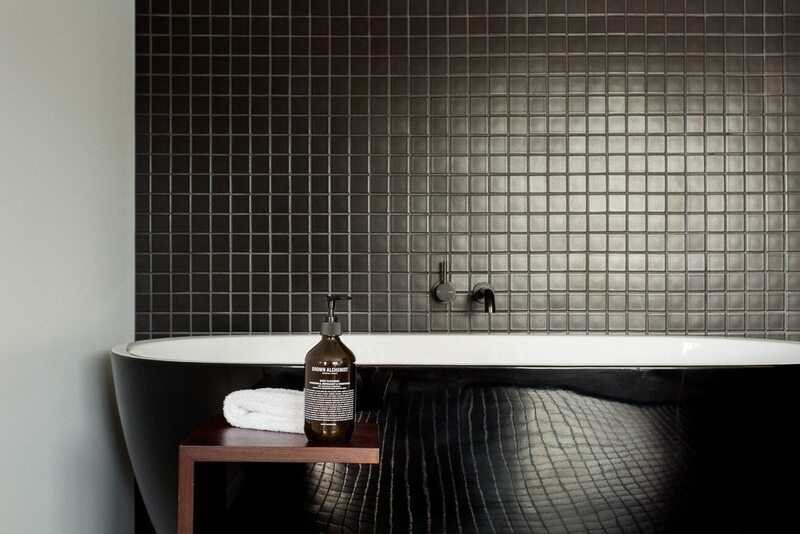 A deep-soaker tub — complete with candles and bubbles and a nice glass of wine — is perhaps the truest hotel indulgence. 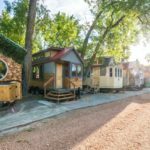 The one thing that can make your stay even better? A sweeping view of something beautiful, so you can luxuriate in steamy satisfaction while soaking it all in. It’s good during the day — and even better at night. Darling Harbour was once home to a derelict former railway yard (back in the 1930s the eastern side was called The Hungry Mile, for all the out-of-work dockworkers), but it’s now a Sydney hot spot, bustling with bars and restaurants and brand new hotels, including the Sofitel, opened just last year. 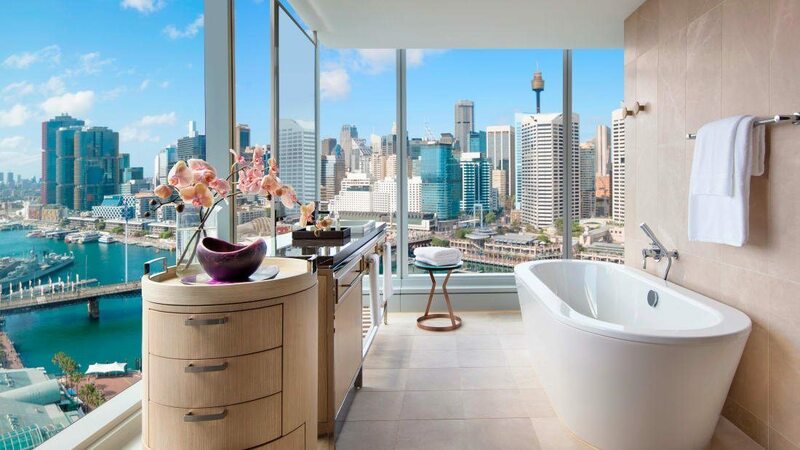 Book into a “luxury corner room” and take in the sweep of the Sydney skyline on three sides, perhaps with a bottle of bubbly from the on-site Champagne bar, which features 20 types, including one bottle that’ll set you back more than $20,000. Float planes are the main means of transportation to the remotest corners of Canada’s West Coast, and Vancouver’s Harbour Flight Centre handles more than 50,000 take-offs and landings every year. The planes skim along the surface of Coal Harbour before soaring to destinations deep in the mountains. 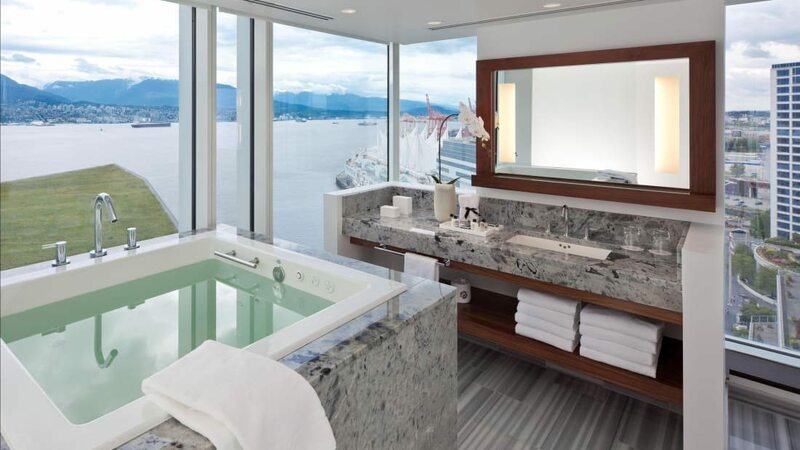 You can take it all in from the comfort of your ofuro, a square, jetted Japanese-style tub, which the Fairmont Pacific Rim has positioned at floor-to-ceiling windows in rooms overlooking the harbor, the woods of Stanley Park, the Lions Gate Bridge, the snow-capped Coastal Mountains and beyond. Manhattan real estate is famously hard to come by, and views of its iconic skyline even more difficult to buy (or rent). But at the luxurious Langham on Fifth Avenue, even the bathrooms have a view. 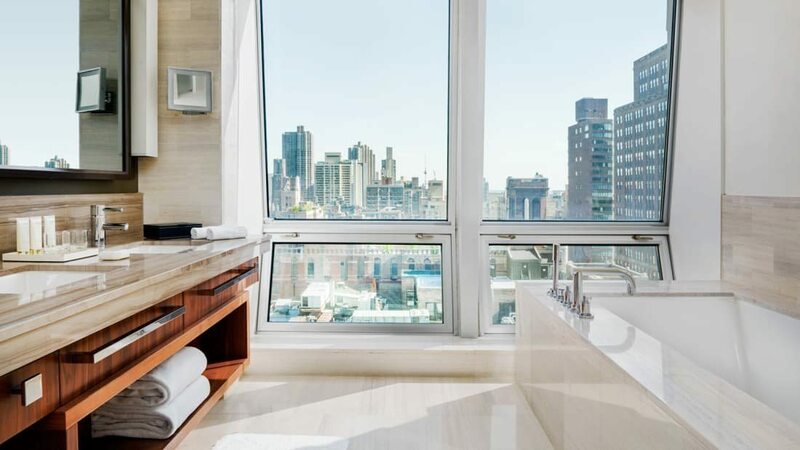 Sink into your deep soaker and take in the lights of Midtown in the city that never sleeps, and when you tire of staring out the window, turn your attention to the bathroom mirror, which, in addition to reflecting a picture of bliss, includes an embedded high-definition television. Dating back as much as 10,000 years, with 90% still submerged, icebergs are truly majestic white mountains floating south on the waves, all the way from massive Arctic glaciers. 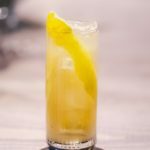 Positioned directly on “Iceberg Alley” — the main waterway for these monsters, with as many as 700 floating by every spring — the 29-suite boutique Fogo Island Inn is on an island in Canada’s easternmost province. 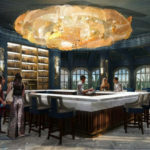 The rooms feature bathtubs where you can sink deep and view the icebergs, just outside, a true fire and ice experience. 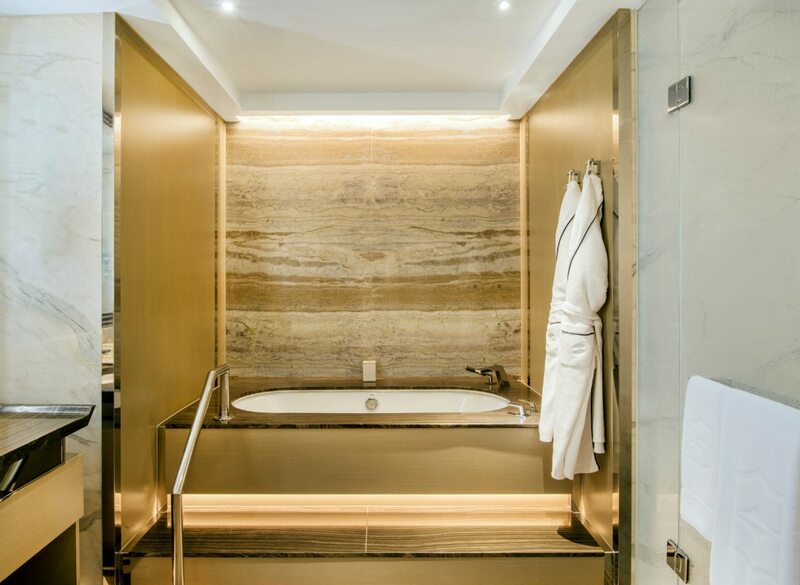 Occupying floors 34 to 52 of The Shard, London’s tallest building, a slash of glass stretching 95 stories to the sky, a bath at the Shangri-La Hotel can be a vertiginous experience, with tubs overlooking the city far below. Take in everything from the Tate Modern to the Tower of London to Shakespeare’s Globe Theatre, as well as the boat traffic rolling by on the muddy Thames, all from the comfort of your bathtub. You may be able to see all the way to the top, but only if you slide all the way to the bottom (and crane your neck). 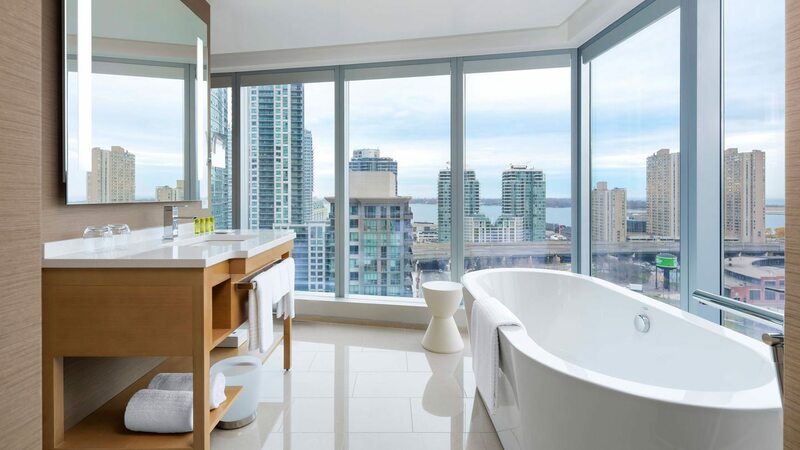 With deep soakers surrounded by walls of glass, a stay at the recently revitalized high-rise Delta Hotel comes with views of the CN Tower, a Canadian icon standing 1,815 feet from base to tip. Turn your head to the left to be treated to views of Lake Ontario (the smallest of the Great Lakes — but still as vast as an inland sea), as well as the Toronto Islands, a summertime oasis with woods and bike paths and quiet waterways where you can paddle a kayak or a canoe. It’s a picture of paradise — with an aquamarine lagoon just a step away. Set over water in the South Pacific, the bungalows at Four Seasons Bora Bora provide views from their own private island back to Mount Otamanu, the dramatic peak that sits at the heart of these Polynesian islands. Spend the day snorkeling, diving or simply sunning yourself on decks that span the length of the bungalow, then head back inside for a long soak, the mountain still in view as the southern sun fades at the end of the day. 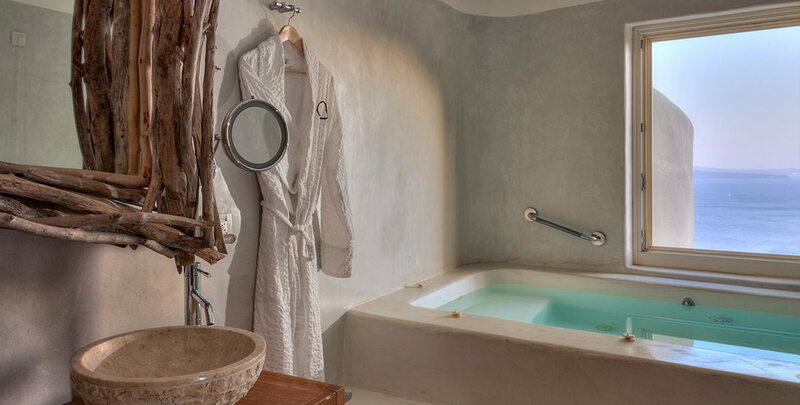 Clinging to the cliffs in Oia — a town famous for its sunsets, crowned with blue domes and white walls and ancient windmills — each of the cavern-like rooms at the luxurious Mystique Santorini features a terrace (and many, a jetted tub) that takes in a view of this island’s famous caldera. Still smoking since its latest eruption in 1950, Santorini’s most distinctive feature was created during the massive Minoan Eruption in the 17th century B.C. Imagine it all while you relax in the warm jets sipping a glass of Assyrtiko, a varietal grown in the mineral-rich Santorini soil. Set inside a UNESCO World Heritage Site and an Aussie national park deep in the heart of Tasmania, Pumphouse Point was created from a decommissioned hydro plant, now transformed into a chic lodge. 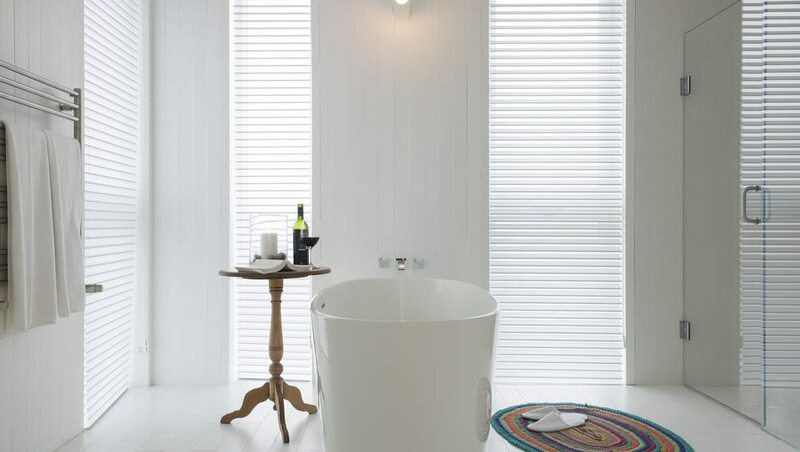 Opened earlier this year, The Retreat, a new self-contained villa, includes a floor-to-ceiling view of lovely Lake St. Clair, a “larder” with local cheeses, meats and wines (including some delicious Tassie pinot noir), and not one, but two dramatic bathtubs. 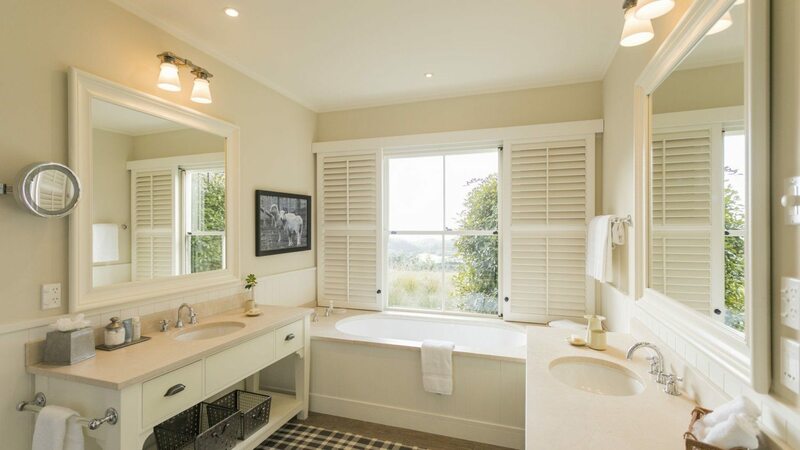 Take an afternoon soak in the outdoor tub to enjoy views of the lake or early evening to spot wombat, Tasmanian devils and other marsupials, then head back inside, where the indoor tub brings the beauty of the surrounding woods into the bathroom through long, slender windows that stretch to the ceiling. Set on the shores of Lake Wakatipu on New Zealand’s dramatic South Island, Matakauri Lodge looks out on a legend. The lake, in Maori history, was created when a warrior slayed a giant, then burned his body on the snow of the neighboring mountains: Cecil and Walter Peaks and the Remarkables. But movie buffs will recognize these peaks from the silver screen, having been used several times in the LOTR trilogy, and they can appreciate them in slow motion from the comfort of this luxury lodge, where all rooms feature a deep tub looking out on the lake and the famous peaks. Written by Tim Johnson for CNN.